Showbiz couple Cheryl and Liam Payne have announced the arrival of their first child, a baby boy. 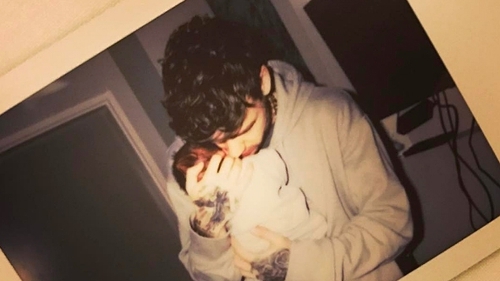 Sharing the happy news on Instagram, Cheryl said: "On Wednesday 22nd March Liam and I became parents to an incredibly beautiful, healthy baby boy, weighing 7lb 9 and looking like a dream." "Although he still doesn't have a name he is already stealing hearts," she continued. She described herself and Payne as "madly in love and overwhelmingly happy with our little arrival". "Madly in love and overwhelmingly happy with our little arrival"
"Happy Mother's Day to all the mothers around the world," Cheryl concluded. "A day that now has a different meaning to me forever." A "blessed" Payne wrote that he was "incredibly happy to welcome our new baby boy into the world". "It's a moment that I will never forget for the rest of my life and my favourite memory I have so far," the One Direction star said. Paying tribute to his partner Cheryl, Payne said he was "completely in awe" of his son's "incredible mother and how she has been the whole way through this". "She's really made my dreams come true," he added. "We haven't named him yet but he's already capturing hearts, including mine." Cheryl finally publicly confirmed the world's worst kept secret by showing off her baby bump in a charity campaign last month. The former X Factor judge had kept mum on the persistent pregnancy rumours, but fans finally got a glimpse of her baby bump when she helped launch the Prince's Trust and L'Oreal Paris All Worth It partnership in the UK in February. The 33-year-old singer and 23-year-old One Direction star Payne first met when he appeared as a 14-year-old contestant on The X Factor in 2008 when she was a judge on the show. Cheryl was previously married to footballer Ashley Cole from 2006 to 2010, parting ways amid allegations he cheated on her. In 2014 she married French restaurateur Jean-Bernard Fernandez-Versini after three months of dating. The pair were granted a decree nisi in November last year in their divorce proceedings.